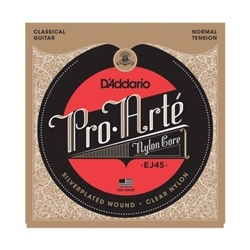 D'Addario EJ45 Normal Tension Classical Guitar Strings. Strings that go the distance..
D'Addario's best selling Pro-ArtÃ© set, Normal tension offers balance of volume and comfortable resistance. Laser sorted clear nylon treble strings for consistent, precise intonation. Precision wound basses for warm, projecting tone and the utmost consistency. Made in the U.S.A. for the highest quality and performance String Gauges: Trebles .0280, .0322, .0403 Basses .029, .035, .043. Environmentally friendly, corrosion resistant packaging for strings that are always fresh.